After a brief rest stop in Front Royal for some breakfast we got to the Shenandoah National Park entrance and I was pretty much giddy. One thing about reading all the A.T. guides and stories is that you picture these majestic places and some you never can fully imagine until you see it for yourself. Skyline, and Shenandoah, is one of those. 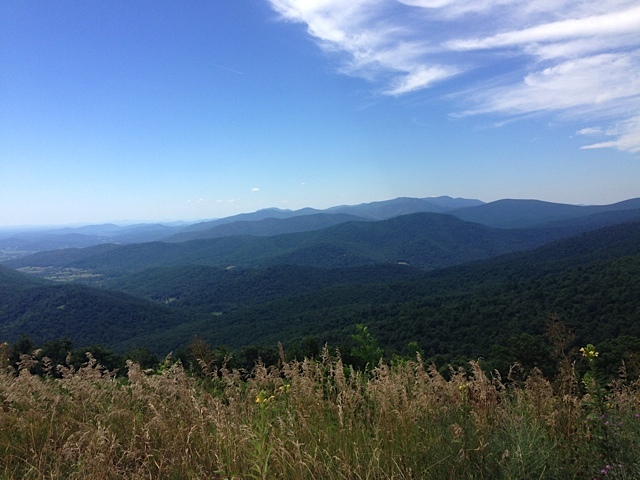 For 109 miles or so Skyline drive follows what was once the original path of the A.T. The trail now parallels the road sometimes closely, sometimes not. The road, like the trail, travels along the winding mountain ridges — climbing, descending and twisting up and down past almost 100 spectacular views to the valley below. Almost every one has a pull over spot to take it in without holding anyone up behind you. I lost count of how many pictures I took, and just reveled in the glorious eye candy before me. Its certainly been hard to pick just one or two of each amazing spot to show you here. We will be back sometime to hike the whole thing! 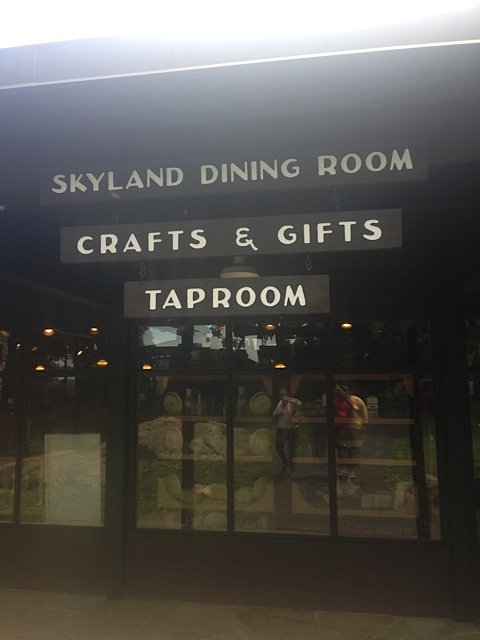 We drove through and checked out one of the campsites near Mathews Arm, and then stopped for lunch and a hike at the largest wayside in the park, Skyland. It has numerous cabins you can rent, and a glorious dining hall hanging over the cliff side with views to the valley thousands of feet below. 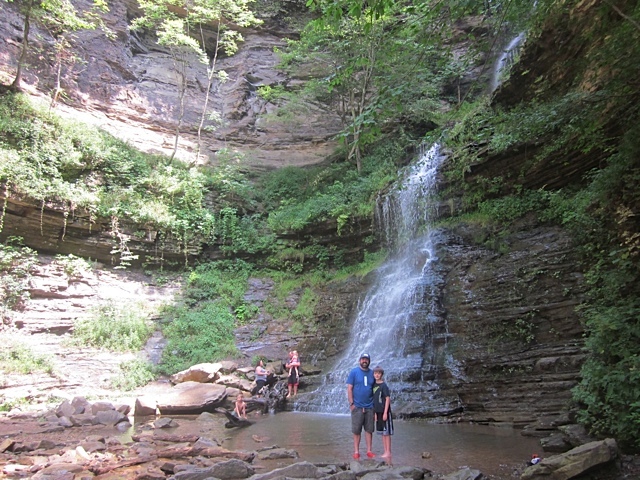 A few thru hikers and section hikers were enjoying a fairly luxurious break as well. Though they worked much harder to get here, for sure. After lunch we raided the gift shop, and then drove over to the parking lot nearby for the Stony Man trail. I researched many of the overlook hikes in the park, and this one was the best option as it was short enough to do on a break to stretch our legs, and also was physically manageable by everyone in our group. Again this time we had the leisure of being day hikers, walking only about 1.2 miles round trip from the trailhead at about 3,700 feet through Rhododendron and Laurel thickets on a mostly gentle path to the breathtaking views of Stony Man summit. My only regret is not seeing them all in full bloom a month or so ago. 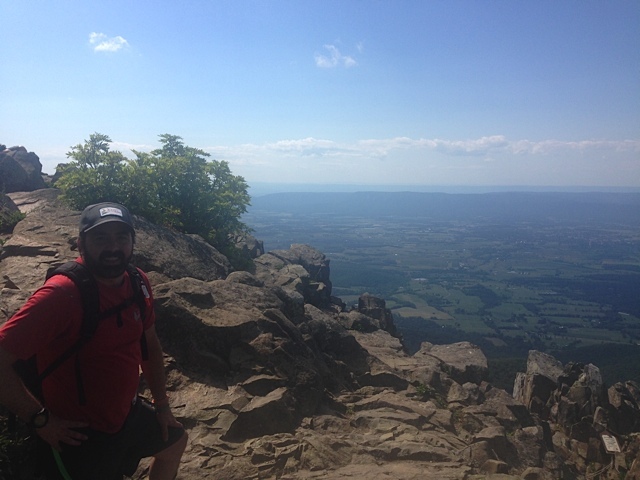 The second highest peak in the park, Stony Man summit extends out on a rocky precipice 4,014 feet up, with sweeping views of the park, Skyline drive, the town of Luray, VA and the Washington and Jefferson National forests beyond. Very little work for such reward. There is even a horse path that comes up to the summit before the outcrop from the stables at Skyland, and you can park your horse at a hitch (is that what you call it) before walking out to the summit ledges. We shared the first half mile of the walk with the A.T, and then it continues on to the Little Stony Man cliffs below where we stood now. Those cliffs also have famous views and had we more time we would have made a bigger loop of it. Unfortunately a group of at least 20 teen girls from a sports camp in the area poured out onto the precipice just minutes after we arrived there, now marring the view, and the experience. While I fully support and encourage the idea of getting youth to such incredible places, and seeing the joy and appreciation of this place on all their faces, their leader clearly had no idea about how this might impact those around them. He should have led them out in smaller groups, taking turns on the summit ledges, so that the others already there could continue to enjoy it without crowds blurting OMGs while taking selfies. On another day, I might have left a polite note on their van about sharing the space more respectfully, but I was in vacation mode and too busy taking it all in in whatever way I could. And anyway, Fielden Stream found a side trail down to an unspoiled part of the ledges and we had a few minutes to soak it in, take our own photos, and head back. 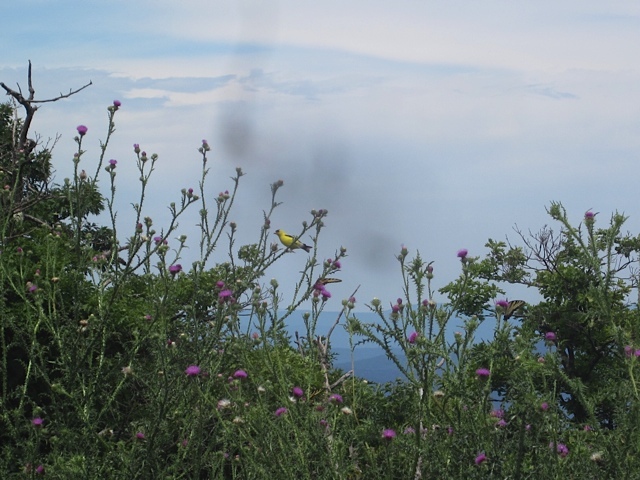 We wound along another 60 miles of Skyline drive over Big Meadows, Pass Mountain, Loft Mountain, and eventually to the southern end at Rockfish Gap as we came into Waynesboro. I knew from my A.T research that it had a lot of amenities for hikers including a very popular all-you-can-eat Chinese buffet. But the town was much more than we expected. We dined at a fusion Asian restaurant with lots of flare, recommended by the hotel — surely the nicest Holiday Inn we had ever been in. They had pancakes till midnight and a 24 hour pool! Then the next morning we visited the fantastic Rockfish Gap Outfitters and while there Fielden Stream got a new hiking skirt and we left a raincoat found on the A.T in a hiker box. A trail angel had come by looking for hikers who needed rides and said at one point in the peak of the hiker bubble he was shuttling 60 a day to and from the trail a few miles away! The girls found a gas-station-turned-cross-stitch store and Jiffy Pop and I went to Waffle House and had a nice chat with some locals before it was time to head on back to W.V. The drive west was equally lovely, as the mountains continue on the other side of 81 and never really end once you’re in West Virginia. 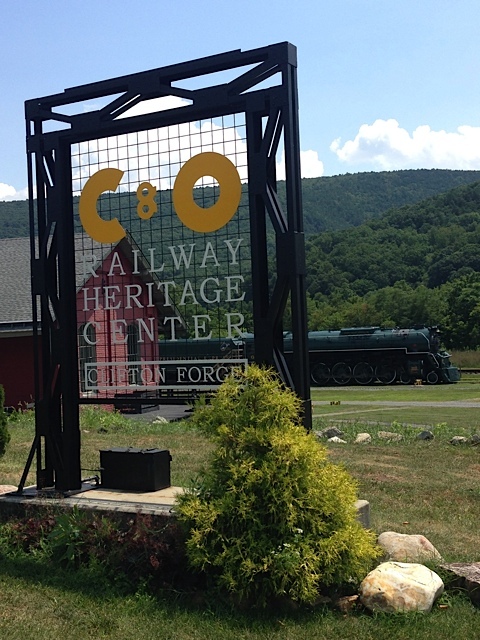 We stopped in a historic little town called Clifton Forge (Virginia), rife with C&O railroad history. They have a rail museum there and much of the town looked to be still somewhere in the 1950’s, including where we ate lunch. It was very quaint and I felt like we stepped into Back to the Future. We then drove on to our lovely cabin on the northern end of the New River Gorge National RIver. The New river, despite its name, is one of the oldest in the world, older perhaps than the Appalachian Mountains themselves, perhaps older than the Nile. And like the Nile, it flows upstream. The end result, especially here, is 50 or so miles of towering mountains on either side of the river gorge. 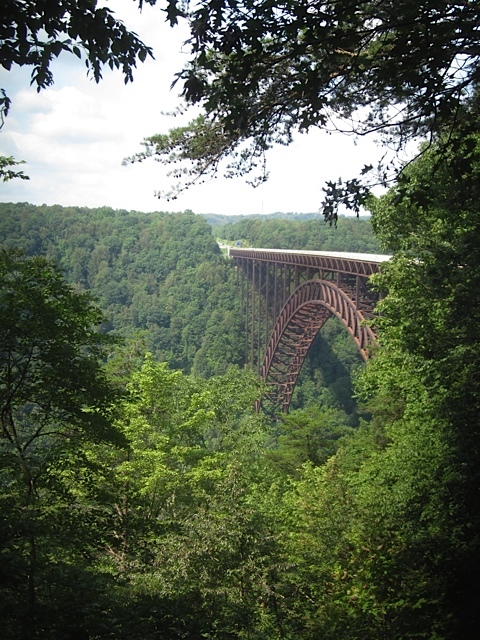 The incredible bridge across it, when completed in 1977, was the world’s longest steel single-span arch bridge. To give you an idea how deep the gorge is, the height of the lower arch above the river is the equivalent to stacking two Statue of Liberties on top of the Washington Monument! Before the bridge you’d have to drive 40 minutes down winding roads and back up the other side after crossing a smaller bridge over the river at the bottom of the gorge. We stopped at the Bridge overlook and then headed for the “Grand View” visitor center. Many trails line the gorge, of all difficulty levels and all start from different visitors centers along the gorge. There is also rock climbing along “The Endless Wall” at the northern end. The gorge is so large, it took us 40 minutes to drive from the bridge up north to the Grand View in the south. We went to the main overlook and for a short stroll with Jiffy Pop, Fielden’s mom, dad, and sister to the northern overlook and then Fielden Stream and I headed off on our own for Turkey Spur overlook, at the other end of the 1.5-mile Grand View Rim trail. Her mom took the road there later to pick us up after we climbed the 100 or so steep steps and newly constructed boardwalks over massive boulders to rewarding overlooks to the east and west. We spent several days in the beautiful cabin, making trips to local artisan shops, barbecuing, and making down-home country meals. The boys took a ‘zero’ and spent the day in the cabin catching up on reading, work, and rest. I took an early morning short hike before the coming rain on the local trails the owner had carved into the hills behind his cabin. The wildflowers and the views were lovely. All in all we had one rainy day out of nine. 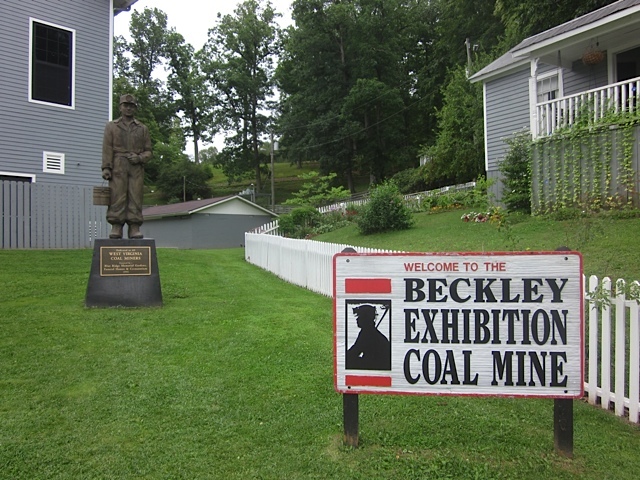 We left for Charleston and the wedding and stopped on the way at the Exhibition Coal Mine in Beckley, an old mine turned-museum where they had re-created much of an original mining town including the mine store, the homes, the church, and owner’s quarters. There was a ride with a tour guide through the old mine which we also enjoyed. He was quite a character and he had grown up in the West Virginia mines himself. It was what you did here. They also had brought in original historic Appalachian buildings and recreated an old Appalachian homestead including an old shop, schoolhouse, barn, carriage house, and moonshine still. And while in Charleston we had the opportunity to check out a few local waterfalls recommended by the family, Kanawha Falls and the majestic Cathedral Falls. After a beautiful wedding, the next morning it was sadly time to go. But the first half of our 11-hour drive was beautiful and included hundreds of miles of beautiful W.V. mountains, and the Cumberland Gap in Maryland. 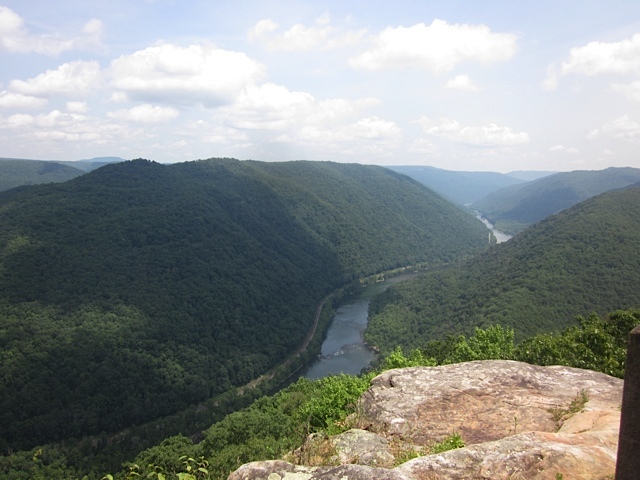 One doesn’t often think of big mountains when they think of Maryland, but the state’s terrain is far more diverse and after the trip to Harpers Ferry in March, and this one, this fact is certain. And this is a vacation we will never forget. 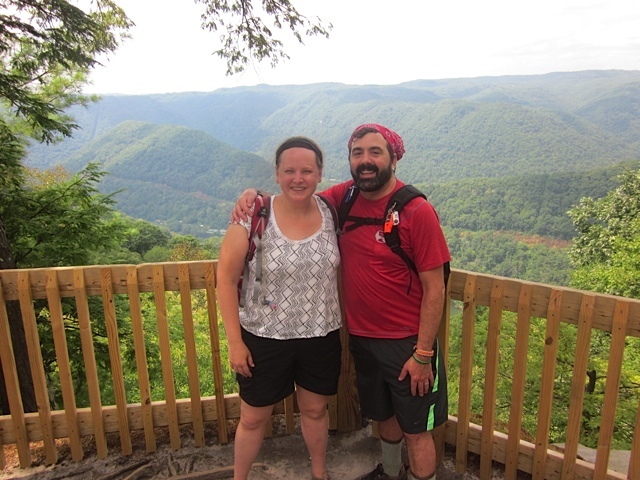 Next week, Fielden Stream and I are back on the Appalachian Trail in New York. Stay tuned!